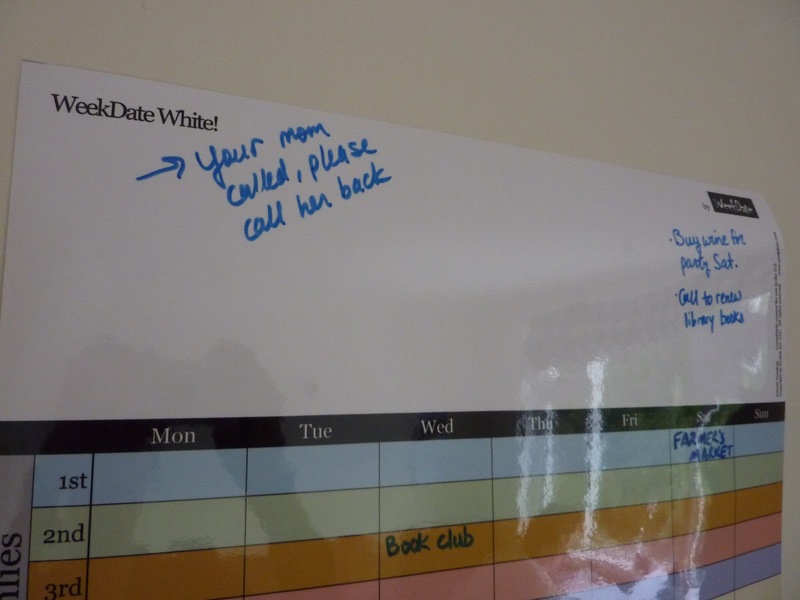 Many thanks to Kay at WeekDate for generously sending me the WeekDate White wipe-off wall planner! You might imagine just how excited I was to get this!! This is an excellent companion to the WeekDate weekly planner (which I am currently using). 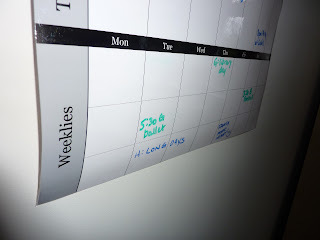 You can find the WeekDate weekly planner on the WeekDate website, read my review of it here and how I'm using it here. 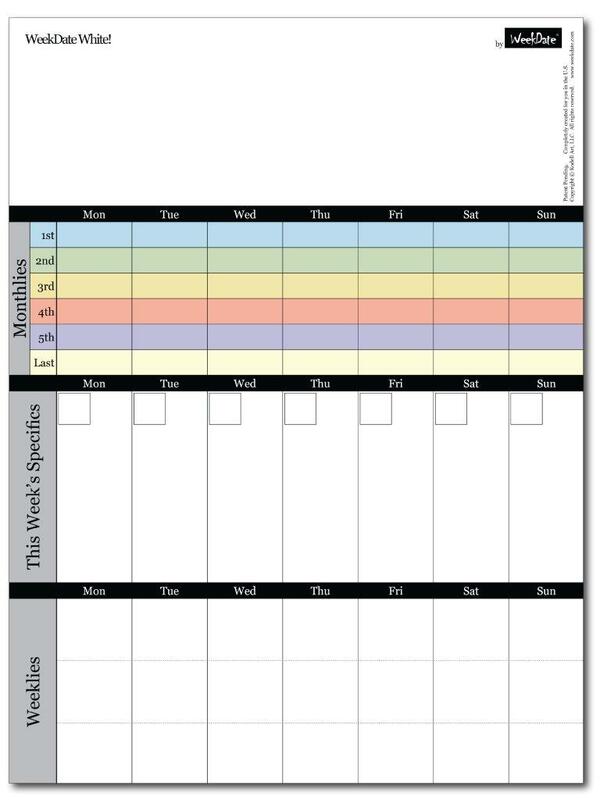 This wall planner can be used with any planner system, or independently. It's great to use at home or work so that everyone can see the entire week's plans. 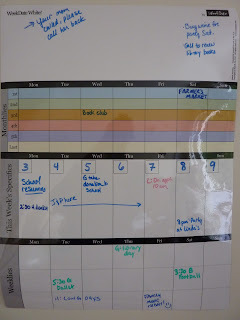 The WeekDate White wipe-off wall planner has the same design as the WeekDate weekly planner, with recurring monthly events on top, recurring weekly events at the bottom, and this week's specifics in the middle. **Above image copyright of WeekDate. The WeekDate White also has a blank space at the very top for notes, lists and messages. 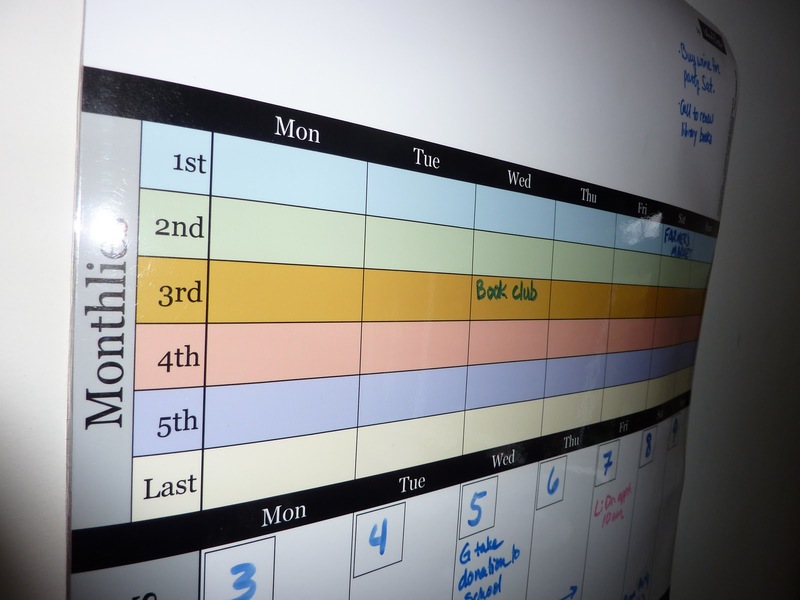 The recurring monthly section is color-coded to indicate what happens the first, second, third, fourth, fifth and last week of the month. Each week you write in that week's specific appointments and events, without having to re-write your recurring events every week. 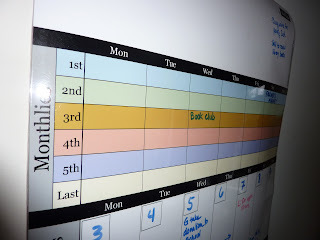 The recurring weekly section is divided into three sections so you can use it for morning/ afternoon/ evening (how I've used it) or use each section for a different family member. 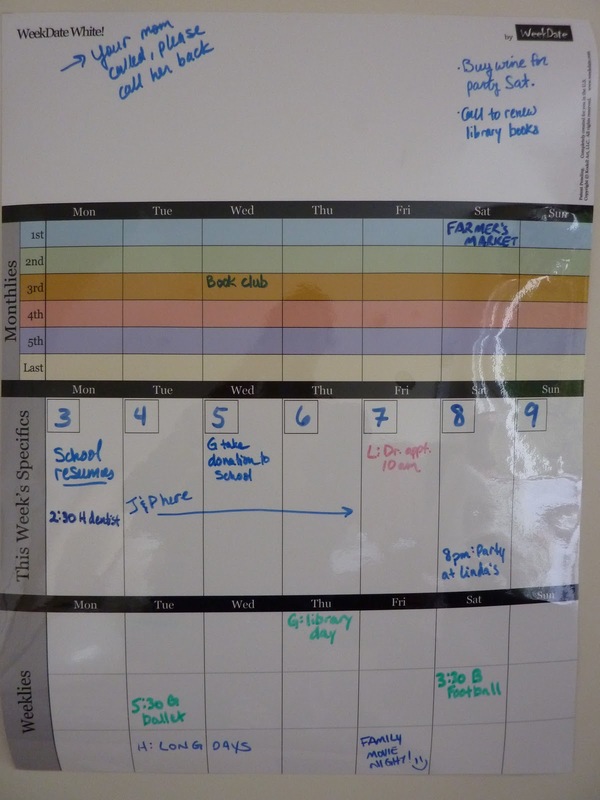 This wall planner is an excellent way to keep the entire family informed of what is happening each week, and for keeping track of each family member's events. And it's especially great when multiple people are scheduling events to make sure that no conflicting appointments are accidentally scheduled. Because all recurring events are visible, there is no risk of scheduling overlap. Something else the WeekDate planners are great for (both this wall calendar and the weekly planner too) is reinforcing routines. For example, if your goal/ New Year's Resolution is to exercise and get in shape, you can schedule your exercise on the recurring weekly section so your workout schedule is fixed. You can set times so that everyone can see when your workouts are scheduled, enabling them to work around them easily. Another use for this planner is menu planning. You can either write that week's menu on the weekly section, or you can write two menus at the bottom of each recurring daily space and have a rotating bi-weekly menu! Everyone knows what's for dinner, and you can plan your grocery shopping easily. The uses for this planner are endless! The WeekDate White wall planners come with either a magnetic backing to hang on your fridge, filing cabinet or other metal surface, or a plain backing to stick on the wall or anywhere else. 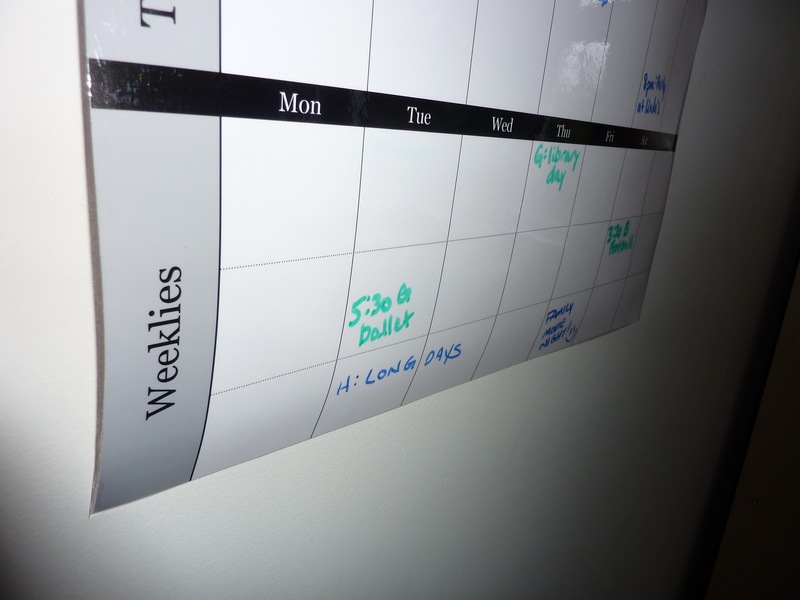 The WeekDate White I was given has a plain back, which was perfect for me to fix to the wall with some Blu Tack. Because the WeekDate White planners are undated, you can use them any time. WeekDate White wall planners can only be found on www.weekdate.com. Many thanks again to Kay for this awesome product! This is a great idea. Unfortunately, it's too small for work, where I really need it. 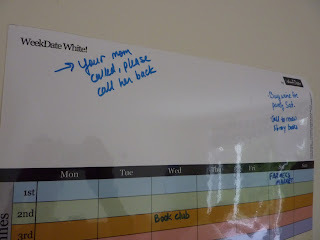 But I've formatted my big whiteboard in a similar fashion. Across the top I've got 5 columns, each with a 'week commencing' date on the top. Underneath I write what's happening that week. This is helpful as I have some things happening monthly, some fortnightly, etc. I can look at this part of the board and see what's coming up over a 5 week time period. As each week finishes, I erase that week and then continue by putting in the next week not already up on the board in a different colour so I always know where I am on the board. Underneath this I have different blocks of text: projects that are pending, ongoing projects, tasks for the hospice, tasks for the shops. Four different colour markers. Across the bottom I have a little room for three yearly tasks so I can make note of things that need to be done in the future. Yet another colour. I also manage to have enough space in the middle of the board to list things that I have passed off to my boss to review, so I don't forget to chase them up. This system is only a couple of months old for me, and I couldn't work without it now! I've recently taken on a large project that will have lots of parts to it and I'm thinking that this means another whiteboard as my 3' x 4' is full! Thank you, Laurie!! 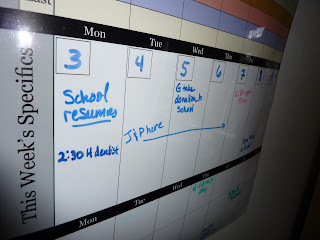 If your blog hadn't introduced me to WeekDate I never would have thought to format my board like this and it has been a lifesaver! I disagree that this planner is suitable for multiple families. 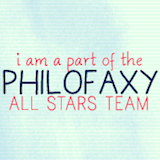 With a 6 persons-household, I would barely have enough space to write two recurrent activities, let alone 6. Maybe they'll come up with a family version some time! Jotje, I disagree. This planner is very large: it measures 18 by 24 inches. Even if each family member has recurrent events each day, it would still have space to record it all. All our whiteboards in the kids' rooms and study rooms have edges to stop the eraser from bleeding the marker into the walls with an inadvertently rushed wipe. I wonder if that could be a problem with these flexible wipe-off planners? Hmm, I never thought of that. So far so good with mine.